A man is suspected of crashing his car into a Skyline home and fleeing before being apprehended by police early Saturday morning. Photo via OnScene.TV. A man is suspected of crashing his car into a Skyline home and fleeing before being apprehended by police early Saturday morning. According to police, the residents of a home in the 7000 block of Skyline Drive were greeted soon after midnight by a Honda plowing through the front of their home. Officers were called to the scene at 12:22 a.m., San Diego Police Officer Steve Bourasa said. The driver ran from the crash, but police said officers were able to catch him a short while later. Drunk driving was suspected as a factor in the crash, according to Bourasa. Officers at the scene also reported a smell of marijuana, he said. 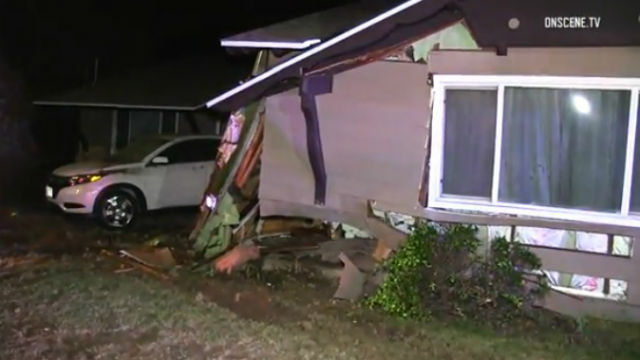 Joana Hallcox told NBC San Diego the driver had crashed into her son’s bedroom, but he wasn’t in the room at the time. The crash caused significant structural damage to the home, Bourasa said, but no one was injured.